I have a large number of iTunes .m4v files that I want to convert to .mp4, .mov or swf. Is there any converter that turns iTunes m4v files to mp4, mov or swf? To answer the above question, you can seek help from some M4V Converters to convert M4V to MP4, MOV or SWF. But, as we all know that, iTunes M4V Videos are protected by Apple FairPlay DRM which make them more difficult to be converted. Common M4V Converters cannot handle iTunes DRM Videos. NoteBurner DRM M4V Converter endeavors to be a professional and powerful iTunes DRM M4V Converter, which can convert DRM M4V videos at fast speed with high quality image and leaves other similar M4V Converter in the dust. To convert DRM M4V, first you need remove DRM from iTunes videos and then try to convert. NoteBurner M4V Converter Plus just can do that. It combines DRM Removal and Video Converter together, which makes it possible to convert DRM M4V videos to other video formats like SWF, MP4, MOV, MPEG and FLV. To get lossless SWF video files, the impressive and intuitive NoteBurner DRM M4V to SWF Converter can help you. Convert both DRM M4V rented and purchased files to SWF within several clicks. Converter iTunes M4V on Windows or Mac OS (Including Windows 10 and Mac OS X EI Capitan). Convert iTunes DRM M4V to other popular video formats, such as SWF, MP4, MOV, AVI, FLV, MPEG, ect. Keep the lossless audio of the original DRM-ed M4V videos. Convert DRM M4V to SWF at fast speed. Launch NoteBurner M4V to SWF Converter, and click the "Add Movies" button with a following pop-up window to add iTunes videos. You can add both iTunes rented and purchased videos as you want. 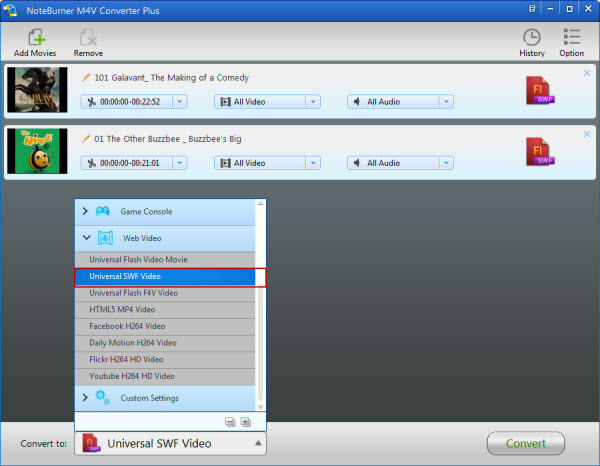 To convert M4V to SWF, please choose output format as "Universal SWF Video". You may find there are many other formats available for choosing. Click the option button, and there will pop up a window to let you customize output path. If you do not change the output path, the converted video would save in the default folder. Click the "Convert" button to start converting M4V to SWF Format. After it is done, you can find the converted SWF file, and transfer them to your devices for watching. Please note that there is also Windows version for you to convert DRM M4V to SWF. You can learn more about NoteBurner DRM M4V to MPG for Mac here. What's next? 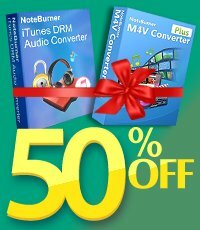 Download NoteBurner iTunes M4V to SWF Converter now!